A long titled post suitable to a properly labor-intensive and delicious cold-weather meal. 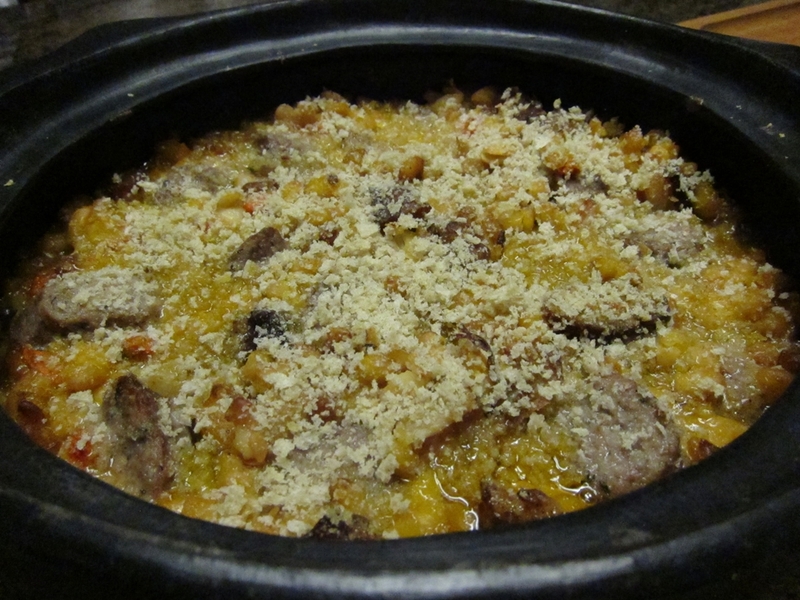 Both the Toulouse-style Cassoulet and the Walnut Tart are based on Paula Wolfert’s recipes in her book “The Cooking of Southwest France“. The bread is the Pain de Campagne (country bread) recipe from Peter Reinhart’s “The Bread baker’s Apprentice“. 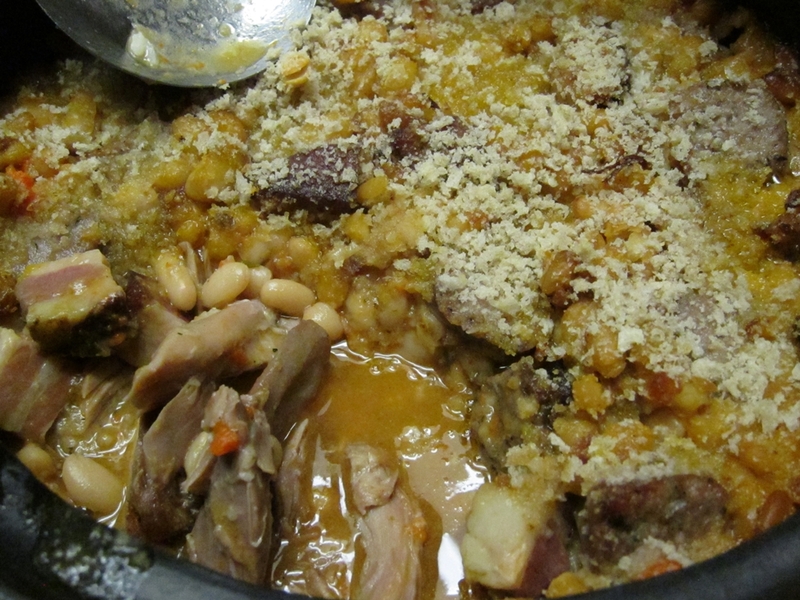 Making a proper Cassoulet is a good bit of work and to get the most out of this dish you really should not cut corners. Boiling some beans and adding in a couple of sausages might be good, but is really not the same animal. 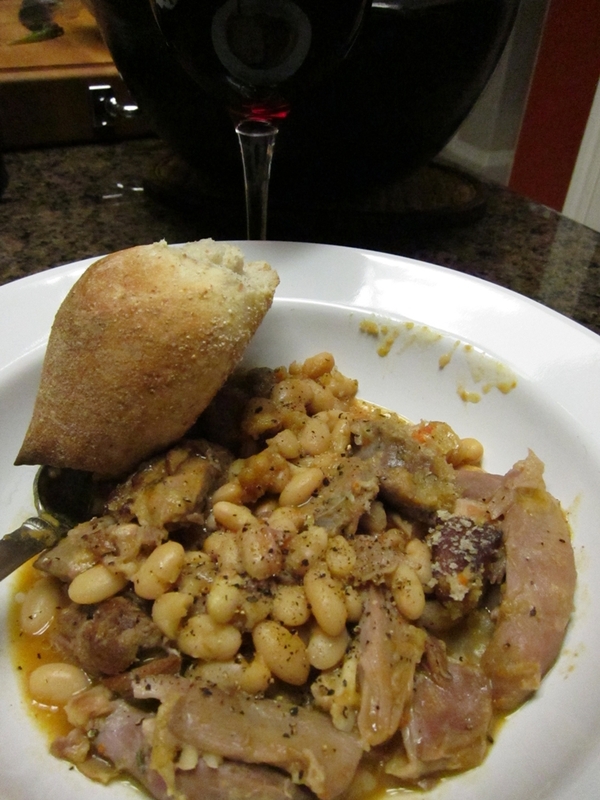 It’s almost “wrong” to make a Cassoulet that does not take a couple of days worth of work (mostly unattended simmering or resting). It’s part of the enjoyment that goes into it when you crack that crispy breadcrumb crust that you know how much work really went into making this sublime dish. It helps a lot having a freezer and larder that is fully stocked. I already had home-cured pork belly (pancetta), home-cooked duck confit, good rich stock (venison in this case), trimmed and cleaned pig skins, home-made Toulouse-style sausage and a few pounds of wild boar. This means I could dive right into cooking the Cassoulet and putting these items together without having to worry about making confit or shopping for pig skins and duck fat. 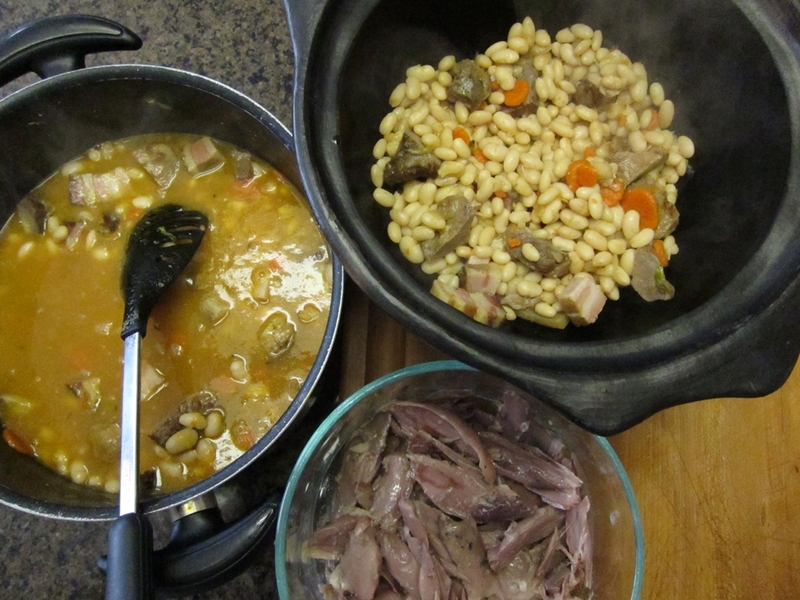 So, what is involved in making a Cassoulet? – Simmer pork shoulder (I used wild boar), pig skin, along with aromatics and vegetables (leeks, carrots, thyme, bay, a little tomato paste…) until mostly tender. – Add in a pound or 2 (Wolfert uses two for a HUGE Cassoulet, I used one to make half a recipe) of soaked white beans and cook until tender. 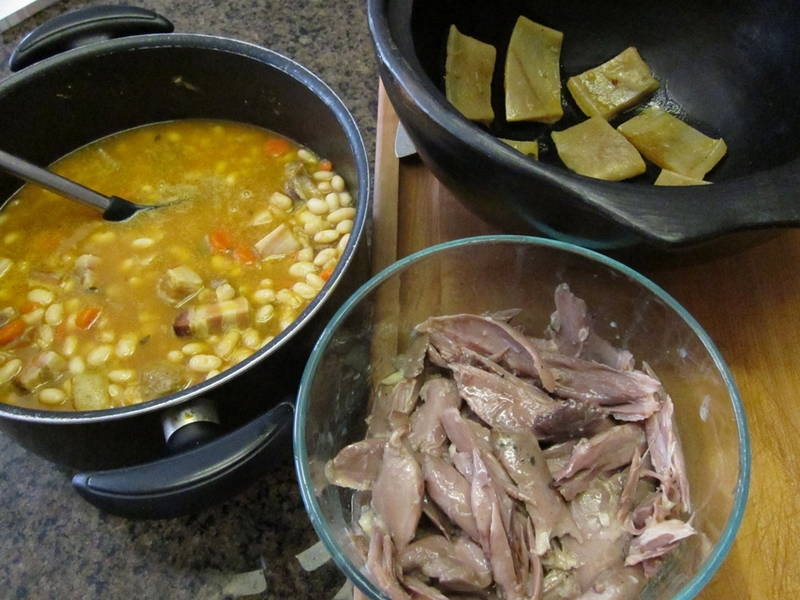 – Seperate the beans and stock from the meats. Store in the fridge overnight or for a few days. – Enrich the stock by pureeing some of it with garlic and pork fat. Add that to the beans, rest of the stock and the pork chunks. Simmer for a little bit. – Remember those Toulouse sausages I mentioned earlier? Cook those separately. I cooked them sous vide till done. Cut them into pieces. 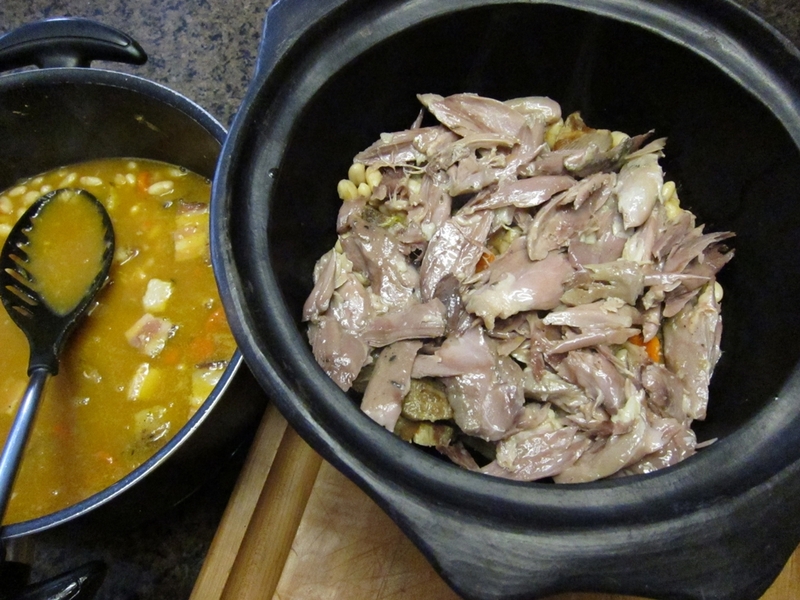 – For the duck confit, just remove the skins, take the meat off the bones and leave it in big chunks. 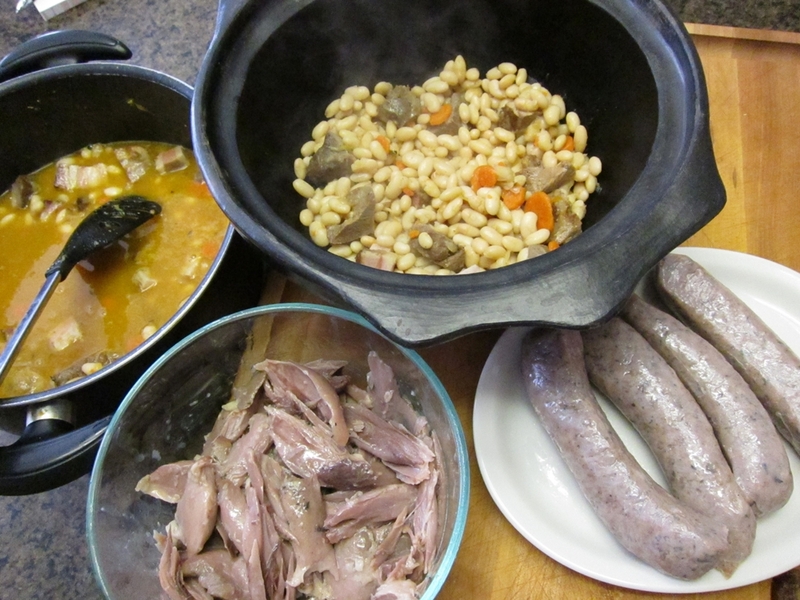 – “Build” the Cassoulet by first laying the flat pieces of cooked pork skin (the one we simmered with the beans) in the bottom of a large pot. I used one of my Colombian Chamba clay pots. – Top that with half of the bean mixture, then the duck confit. 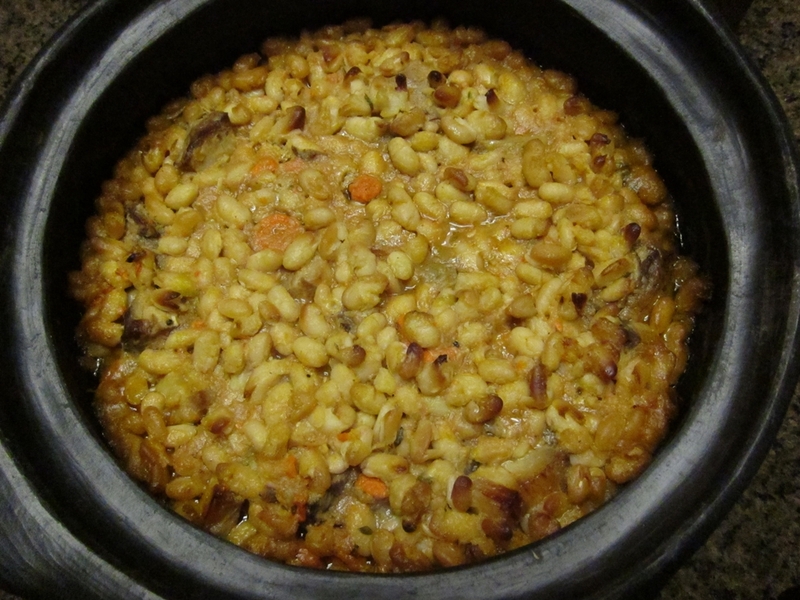 Top with the remaining bean mixture. Use a perforated spoon here so that you can control how much of the bean stock is needed. I ended up using all of it for the liquid to come up barely to the level of the beans. 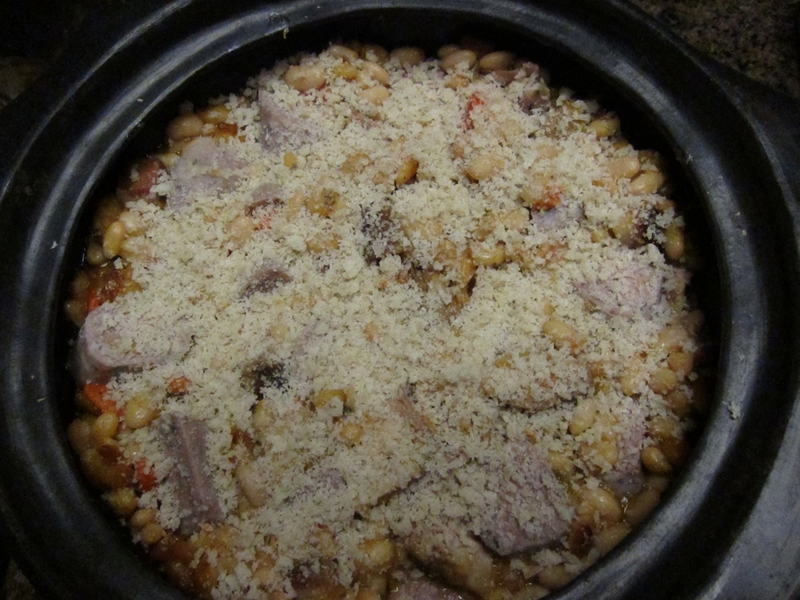 – Bake the Cassoulet for an hour or two. A skin will form on the surface. 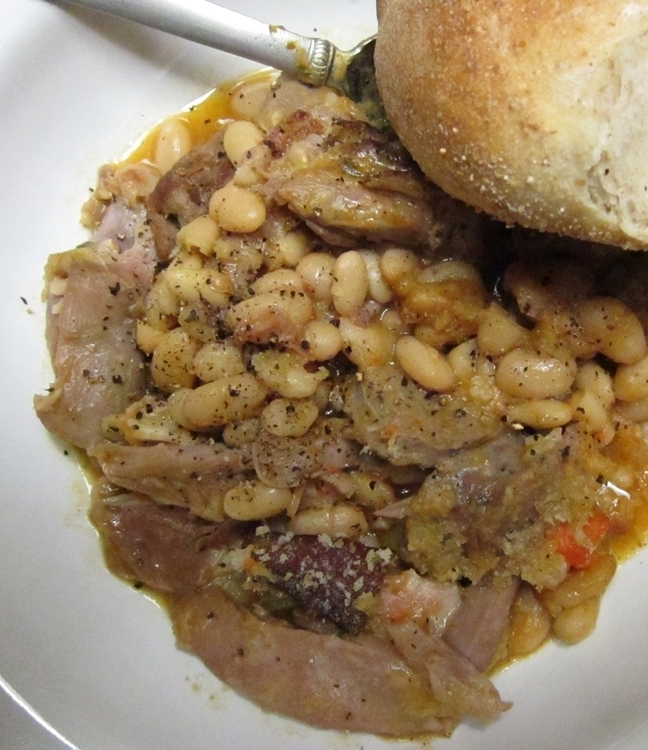 Stir that “skin” into the Cassoulet. Bury the cooked sausage chunks in the beans leaving them slightly exposed. Top with a tablespoon or two of breadcrumbs and a drizzle of duck fat. Bake until crispy, bubbly and delicious. – Let it rest for 5-10 minutes at least and dig in. It really sounds like much more work than it is. Most of the cooking can be spread out over a couple of days and you will be rewarded with one of the most delicious of French comfort foods ever. It’s one of those dishes that if done right are satisfying and rich but not cloying. It should not be mushy or fatty. To get that result, one needs to pay attention to the small details. Detail1: DO NOT let the beans boil like crazy. As soon as the stock comes up to a boil lower the heat to a very gentle simmer. This way you can control the cooking process better and can cook the beans perfectly. Rapid boil will almost insure burst beans. This will make for unpleasantly mushy beans, a thick cloudy stock and will emulsify the fat in it making it more difficult to de-grease. Detail2: A key reason why a good Cassoulet should be stretched over a couple of days is de-greasing the stock. Storing the beans in the cooking liquid in the fridge will form a thick layer of fat on the surface from all those meats. It’s easy to remove that before continuing with the cooking and baking. What to serve it with? Other than red wine? You really don’t need much else, but a piece of good bread and a tart salad are excellent accompaniments. 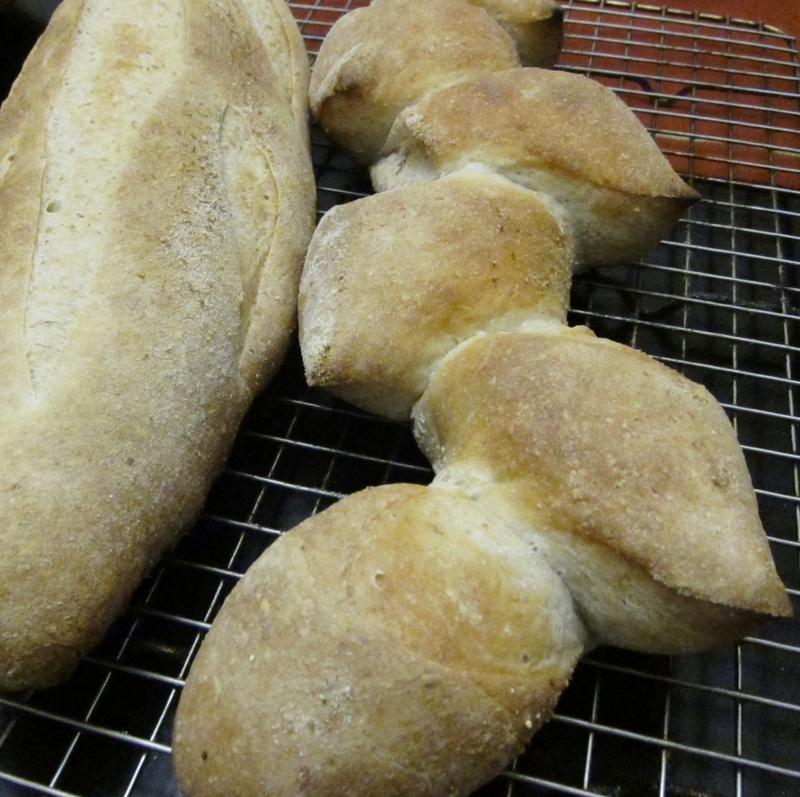 I shaped the bread specifically for the Cassoulet dinner into an epis (wheat tip) so we could just break off pieces instead of slicing…and it looks pretty neat. The salad was a simple mixed baby greens mix with a vinaigrette of raspberry vinegar and walnut oil. It only seemed appropriate that to cap it all off, I would make a dessert from the same region. 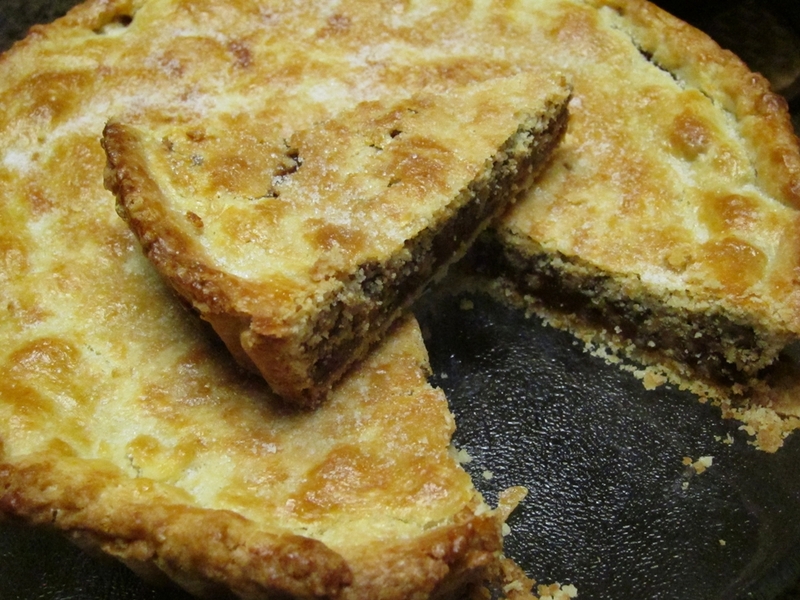 So from the same book, I made Wolfert’s walnut tart or as she calls it Walnut Tart from Masseube. This is not a typical tart, more of a cross between a cookie and a tart. The filling is a mixture of walnuts and a dark butter caramel. This gets poured into a tart shell lined with a sweet short pastry crust. Another layer of pastry goes on top and then it is baked. When the tart cools the filling sets pretty firm, like a pecan pie filling minus most of the “goo”. We really loved this with a cup of coffee and a touch of whipped cream.